Flowers will capture the elegance of your wedding ceremony. Whether you've chosen a church, an outside park setting, a home, or the reception hall for the ceremony, flowers will add the artistic touch. A floral arrangement at the guest book registry will welcome your guests. 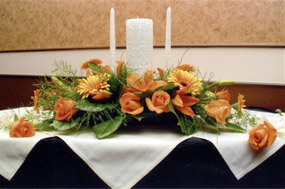 Don't forget flowers for the time-honored symbol of love; the unity candle. Enhancing the altar with flowers adds ambiance to the ceremony. 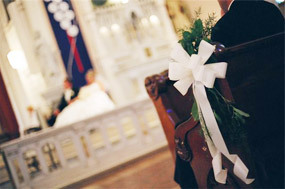 Gracing the pews or chairs with bows and greens creates a simple sophistication. Together, we'll share ideas on how to create a memorable occasion.